Will the device still work if i change vehicles? Yes, Once the device is fully active you can switch it between vehicles as you desire. 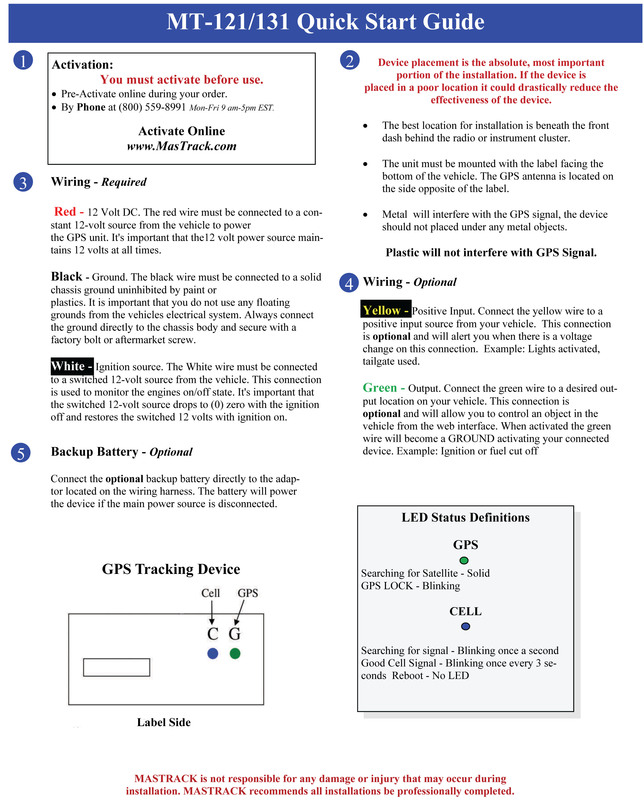 Is the OBD unit really that easy to install? Yes the OBD unit can be installed in less then 30 seconds. All GPS tracking devices manufactured by MasTrack use the cellular networks to transmit data back to our servers. All the location are obtained using a minimum of 4 satellites . We offer service on AT&T, Verizon or T-Mobile. If you have a preference let us know when you make an order. There is no extra charge for any network. By default, all GPS tracking devices manufactured by us do not make any noise. Although silent by default, some devices are capable of buzzing to correct driver behavior. Contact customer support if you are interested in this feature. All devices have dim LEDs. You can cover them if needed and it will not impact service. Does my car have an OBD port? Every passenger vehicle manufactured since 1996 has an OBD port. All GPS tracking devices manufactured by MasTrack use both the satellites and local cell networks to transmit data. Just like a cell phone the networks charges for air time. ALL tracking data transmissions along with unlimited email and text message alert notifications are covered in the cost of the service you select. There are NO additional Charges. Do I need a service plan for each device? Yes, each device operates on the network and requires a unique service plan. This covers all the associated with operating along with email and text message alerting. We do offer fleet discounts starting at 5 units. Contact our sales department if you qualify. Who do you use to ship/how long does it take? Standard shipping is USPS 2- 5 day. If you need a special shipping please contact our sales/support team for an exact cost. Can I view my tracking on my phone. Yes our tracking platform is mobile friendly. You can also use our iPhone and Android app. Your history is available for as long as your device is active, from the day you start service to the day you cancel. No, you can pay month to month or opt to pay for 3, 6 or 12 months for a discount. Do I need to purchase anything else other than the device and service. No, the device and service covers everything you need to track. You do not need to buy anything additional. Is there an activation fee. No. There are no additional fees. Your service plan covers everything you need. Yes you can change or cancel your service at any time. You can cancel service at any time. There are no penalties or fees. Simply log into the tracking portal and view, change or cancel your subscription information. Where are you located? Where am I calling if I need support? MasTrack is a GPS tracking device manufacturer that is based in the USA and is completely owned, operated and staffed by U.S. workers. You may call our 800 number to speak to our support staff.or you may contact us directly from your tracking portal 24x7 to have one of our staff address any questions or concerns. How do I see the tracking? You can view the tracking anytime, 24x7. The tracking portal displays tracking on an interactive Google map and is available from any major web browser, your mobile device, or IOS and Android apps. The devices will work anywhere in the US (including Puerto Rico, Hawaii and Alaska). We also offer service in many other countries, often at no additional charge. If you need service outside of the US please contact our sales department.